At GHO Homes we have a philosophy that when you buy a home from us, it should be Uniquely Yours! It is this philosophy that separates GHO Homes from every other builder. 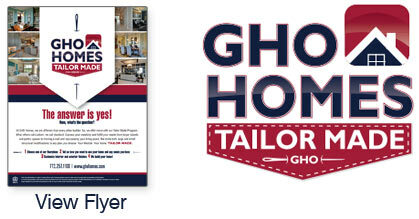 To showcase this, GHO Homes developed the Tailor Made program. The GHO Tailor Made program allows homebuyers to customize their new homes with numerous options, built-ins and upgrades that far exceed industry standards and ensures that our homes fit your unique life and style. Express your creativity by enlarging the island in your kitchen, expanding the pantry, add a workshop to your garage, extend the length or raise the roof. Add a half bath, expand the patio, add a sitting room in your master bedroom or do you need two master bedrooms? Are your in-laws moving in with you? If so, modify the plan to give them their own master suite, kitchenette or sitting room. Essentially, any large or small structural modification or lifestyle change can be made to the plans. Sit back and let us build your home! Feel free to use our custom home search to preview some of our more extensive Tailor Made Homes. When you are ready to discuss your new home plan with GHO Homes, our fully versed on-site sales consultants will be able to walk you through the sales process of our Tailor Made program.